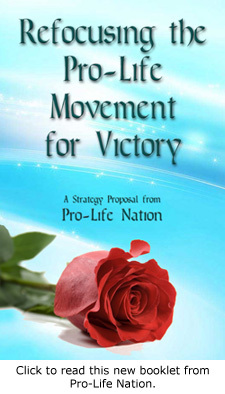 Pro-Life Nation has released a new strategy proposal urging the Pro-Life Movement to refocus its message to ensure victory. Read “Refocusing” – Pro-Life Nation’s groundbreaking new strategy to end abortion! Washington, D.C. — With the recent revelation that over a half billion dollars in tax dollars is being funneled from Federal tax coffers to Planned Parenthood last year, Pro-Life Nation calls upon Congress to stop borrowing money from China to pay Planned Parenthood. Planned Parenthood is the largest abortion provider in the world and received $542 million in taxpayer money last year alone. Their latest annual reports indicate that abortions done by Planned Parenthood have reached an all-time high while “well-woman” services, such as cancer screenings and contraceptive services, dramatically dropped. •	Contact your Congressman and ask that the Federal Government stop borrowing money from human rights abuser such as China to fund the nation’s largest abortion supplier, Planned Parenthood. •	Support legislation in your state to defund Planned Parenthood.